We are already three months into 2019 and it is time to have a small reflection at what I have seen in the cinema and tell you exactly what I thought of every release. Excluding Bohemian Rhapsody (which is a UK 2018 release), I have seen 9 films in cinema. I would have liked to have seen films such as Five Feet Apart or Dumbo by now to put on this list, but unfortunately I have not had time to check them out. Out of this list I have three that I loved, four that I enjoyed, one that disappointed me and one that I full on disliked. Let's discuss what I thought of every film so far in 2019. As I will only be giving brief reactions to each film, full reviews of every film I have done reviews on will be linked with each ranking. I really disliked this film, and had no idea why Adam McKay got in for Best Director at the Oscars over the likes of Bradley Cooper and Peter Farrelly (who ended up directing the Best Picture winner). I found the tone to be completely jarring, the script to be messy and the film just felt like it was trying to be "edgy" at a time where politics is worse than it has ever been. Whilst this movie has glimpses of genius, I cannot forgive how awkward that Shakespeare scene is, especially as I myself have had to study and appreciate MacBeth. This was a film that I was highly anticipating, but just fell short for me at the end. I loved the first third of this film, and even the second third was entertaining. James McAvoy will probably still have my favourite performance of the year in this film, he is just that good. Unfortunately, the last third of the film is badly scripted and all over the place, leaving the film on a sour note. It felt like an insult to watch the ending, as Shyamalan gave himself too many plots and characters to work with, and did not make certain plot points clear in the slightest. Whilst there is nothing special with this film in particular, this is definitely a charming film and well directed by Jon S. Baird. The chemistry between Laurel and Hardy is clear in this film, and I enjoyed the minimalist style that they went for. The opening sequence is gorgeous and well framed, and the same can be said about the closing sequence. This is a film you only need to see once, but it is worth your time and a charming little film for the entire family. Shazam! (2019) - source: Warner Bros.
Whilst this film deals with a subject that seems cliched and overdone, it is done very well and with a fresh perspective by using the WWE. Once again, it does not do anything completely original or breathtaking, but I did find myself very attached to Paige and her brother Zak. I liked the family aspect of this film, as it felt gritty and real. I also found myself drawn to the sub plot of Zak just as much as the main plot of Paige, with neither dragging on or being put further back. This is a well acted and scripted film that everyone can enjoy. Yes, this film does have some scripting issues at the start. Yes, there is some weird choices of tone placed throughout the film. However, I found this entry for the MCU to be completely refreshing to the original formula, and my favourite non-Avengers film since Thor: Ragnarok. I love the choice of Brie Larson as Captain Marvel, and it is so nice to see a Marvel film that is not set in the present day. She is a badass and I cannot wait to see how her attitude will blend in with the rest of the Avengers. Once again, I found that this film had some weird tonal choices as well as scripting issues at the beginning of the film. 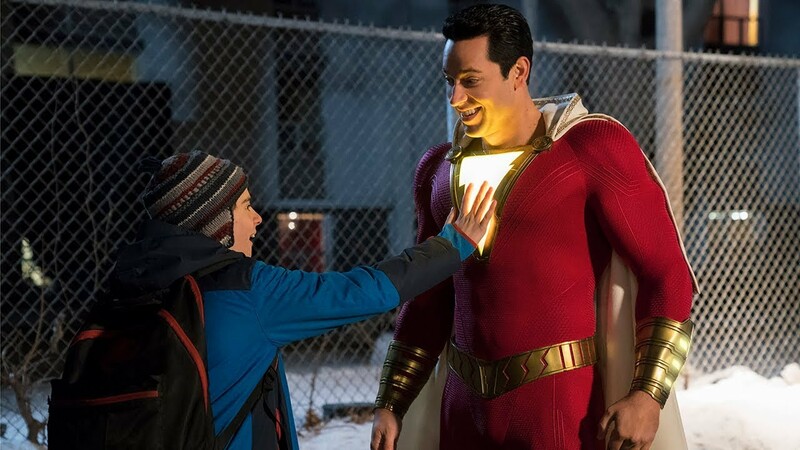 However, once we see Billy Batson turn into Shazam, then it becomes an absolute blast. I have loved Zachary Levi for years now, and I am glad that other people are getting to see how fun and genuine he is. He was made for this role, and he and Mark Strong bounce off each other very well here. I would say that this is the more entertaining of the superhero films, but both this and Captain Marvel are fantastic comic book movies. Being released on January 1st 2019, this was the first film I saw this year. This started off fantastically, because this film just screams originality. It is an interesting concept to tell the historical story of Queen Anne, an era not many people are fully aware of, in such a comedic style. I also enjoyed the feminist aspects of it, and how the big battles at the time are put to the side to focus on there three characters. Olivia Colman completely deserved to win Best Actress at the Oscars just for the badger scene alone, and all of the cast do an outstanding job here. Judging by how highly I have ranked this film, you can tell that I am pleased that it won Best Picture at the Oscars. For me, this is a very well made film that had me invested in the story right from the start. Whilst I will argue that Mahershala Ali is also a leading actor in the film, he did deserve to win an Oscar again for his performance here. Both actors carry the film to its highest potential and you truly feel like you are on a journey with them. If you know me, you know that Get Out was in my top three films of 2017. Us is holding up just as strong, with it being the only film as of right now that I have seen numerous times. This film screams to be watched countless times, just so you can catch all of the hidden references. If this film, alongside Lupita's performance, gets the same treatment at the Oscars that Hereditary and A Quiet Place got last year I will be extremely disappointed, yet not surprised. What has been your favourite film released in the cinema this year? Is there any I missed out, and should go back and watch? Let me know in the comments below and let's have a friendly conversation about film.